It was back in 1993 when the aesthetically intriguing image of a French antique mirror against a dazzling white wall flickered the owner’s imagination to create a blissful holiday retreat that would combine original fine art, first-class luxury amenities and personalized hospitality. 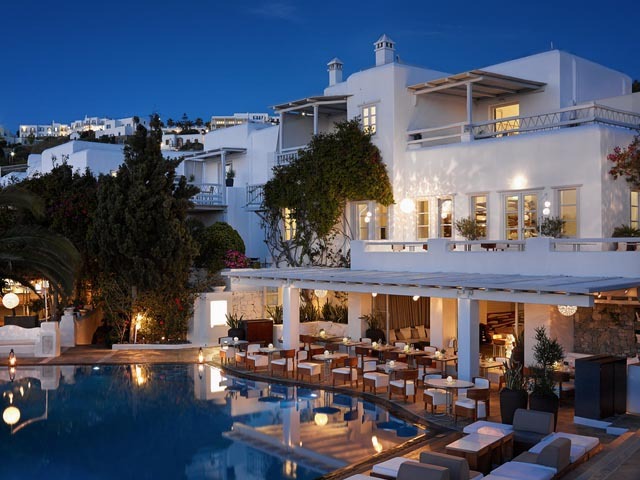 The unique identity of this 5 star Kivotos hotel in Mykonos - that was initially meant to be a family villa - created a distinctive legacy and became a holiday sanctuary for art connoisseurs and modern travel aficionados who desire the finest, most exclusive experiences imaginable. 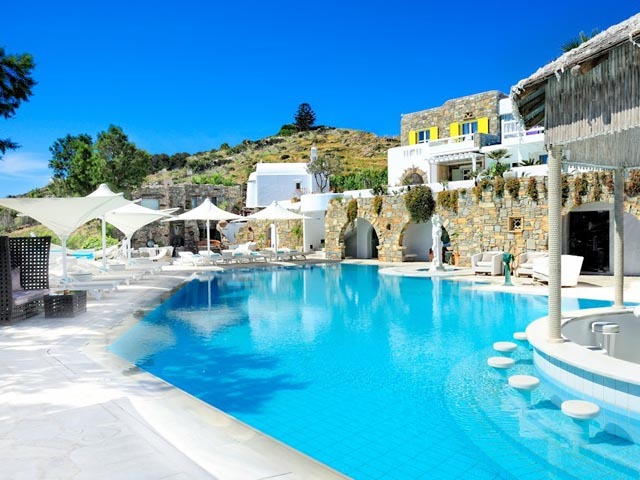 The stunning architecture and incredible interior design of all rooms, suites, villa, SPA, restaurants, and common areas of Kivotos Hotel in Mykonos are truly unique. They surpass the notion of simply making it one of the best boutique design hotels in Mykonos or among the best 5 star hotels in Greece. This is a one of a kind art boutique category, emerging through the graceful amalgam of timeless contemporary art, vintage ultra-chic pieces and ancient Cycladic touches that create a sensational, bold, yet visually balanced ambiance, despite the stylistic contradictions. Kivotos Luxury Boutique Hotel is built at the end of the wind-protected, powder-soft sand beach of Ornos, merely 5 minutes by car -3 kilometers- from the island’s capital, Hora, with the mazy cobblestoned streets, high-end boutiques, restaurants, bars, clubs, and famous landmarks, such as the iconic windmills, the scenic Little Venice, and the always busy Manto Mavrogenous Square. 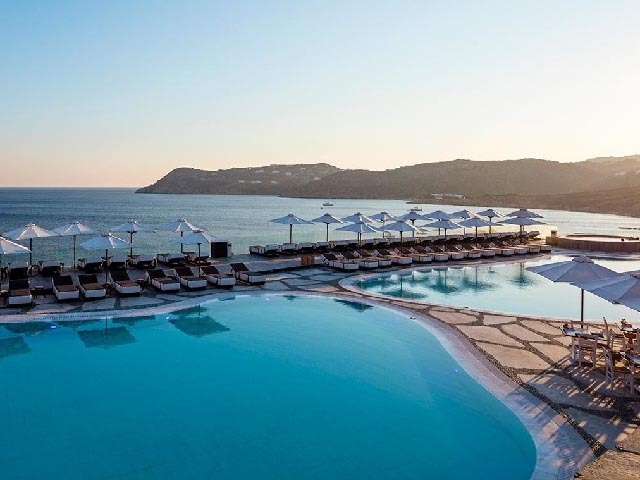 A 5 star architectural oasis, the beachfront Kivotos Hotel in Mykonos Greece offers an array of exclusive services and amenities to its guests. Its world-class facilities include impressively decorated and luxuriously appointed rooms and suites, an incredible villa with a private pool and secluded beach area, two swimming pools with open-air Jacuzzis. 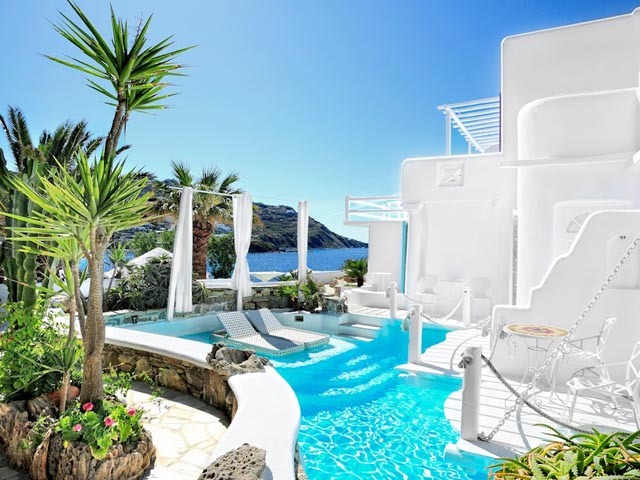 Double Deluxe Garden View:The Deluxe Jacuzzi Sea View Rooms of Kivotos Luxury Boutique Hotel in Mykonos boast an area of 40 square meters, and are airy and filled with Mediterranean light. They feature a bedroom with a double bed, a sitting area with couch and coffee table, a bathroom with Jacuzzi, as well as a furnished veranda with views of the bay of Ornos and the hotel’s pool. 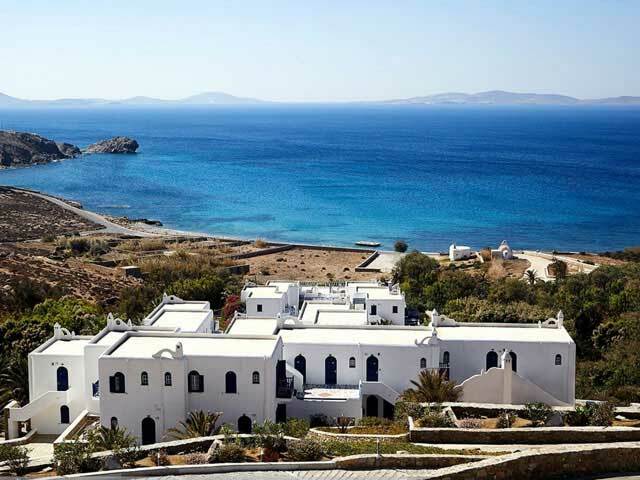 Double Deluxe Garden View:The Deluxe Garden View Rooms of Kivotos Luxury Boutique Hotel in Mykonos boast an area of 30 square meters, and are dashingly elegant, with ingenious architectural touches, and hand-picked classic and modern artifacts. They feature a double size bed or twin beds, with luxury bedding sets, a small sitting area, bathrooms with bathtub or shower and a furnished veranda with garden view. Junior Suite Sea View:The 45 square meter Junior Suites Sea View of Kivotos Luxury Boutique Hotel in Mykonos are dashingly stylish, and spacious. They feature a bedroom with a queen size bed, a sitting area with floor to ceiling glass doors to fully take advantage of the breathtaking sea view, an incredible marble bathroom with Jacuzzi in most cases, and a furnished balcony with unhindered pool and sea views. Most of the bathrooms have clever glass roof openings for romantic stargazing at night. These suites can accommodate a third person, either at the sitting area’s sofa, or with the addition of an extra bed. Suite Sea View:The Suites Sea View of Kivotos Luxury Boutique Hotel in Mykonos boast an area of 50 square meters, and are luxuriously appointed, with ingenious structural and architectural elements, soothing lighting, and sensual ambiance. They feature a spacious bedroom area with a queen size bed, one or two luxurious marble bathrooms, one of which equipped with a Jacuzzi, a comfortable sitting area, and furnished balconies with stunning sea views. Kivotos VIP Suite Sea View:The architecture and spatial design of the Kivotos VIP Suites Sea View creates a unique atmosphere, while their ultra-modern with splashes of classic decoration seductively allure the eye of the beholder. Hidden lightings, soothing colors, high-tech appliances, and the awe-inspiring sea view will simply captivate your mind and soul. The Kivotos VIP Suites Sea View boast an area of 60 square meters and feature a semi-private bedroom with a king size bed, a separate spacious sitting area, two bathrooms, and a veranda with outdoor furniture, overlooking the bay of Ornos and Aegean Sea. Presidental Suite 2Bedroom Sea View:The Presidential two-bedroom Suite Sea View of Kivotos Luxury Boutique Hotel in Mykonos is one class act of its own. The 80 square meter Suite features two interconnecting rooms, one of which can be used either as a second bedroom or as a spacious living and sitting area. There are two stunningly stylish marble bathrooms, one equipped with a Jacuzzi, and a furnished veranda with unobstructed sea views. The classic furniture pieces impress with their elegance, functionality and flair, while the ample space make this fabulous Suite feel like home. 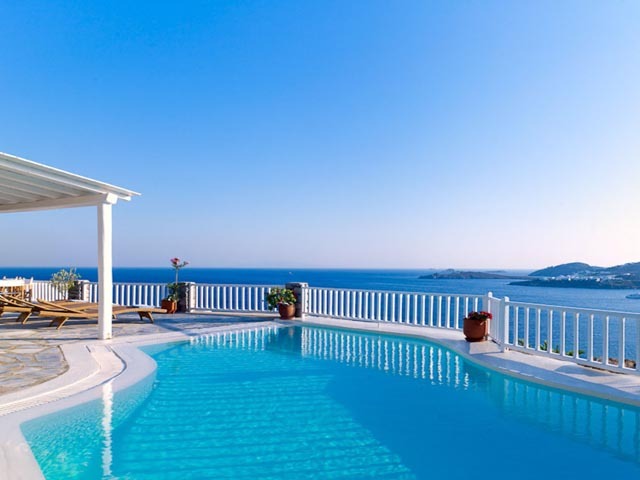 Royal Suite 2Bedroom Sea View:The 80 square meter Royal two-bedroom Suite with Private Pool of Kivotos Luxury Boutique Hotel in Mykonos is truly spectacular. It features two bedrooms with king size beds, two lavish marble bathrooms, one with a Jacuzzi, and a crystal clear private pool for unique moments of relaxation under the hot Mediterranean sun. There is a furnished terrace complete with sun beds and outdoor furniture, with stunning views to the bay of Ornos. 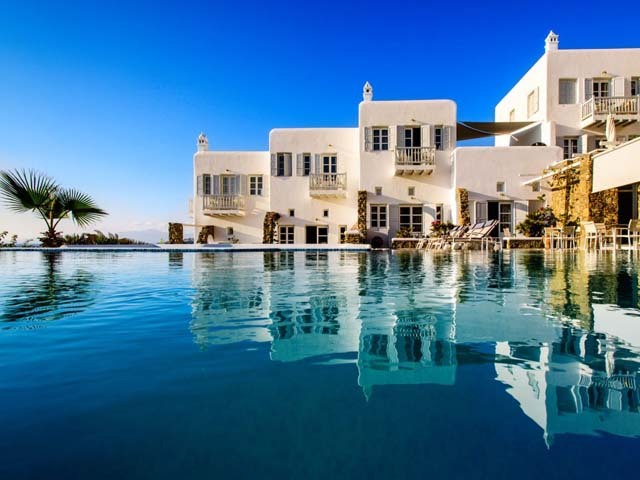 Noahs Waterfront Villa Private Pool:The magnificent 150 square meter private waterfront villa of Kivotos Luxury Boutique Hotel in Mykonos is ingeniously blended into the natural surroundings, and boasts awe-inspiring architecture and spellbinding interior design. There is nothing short of magical about this villa, which has its own private pool and private beach area right in front, complete with sunbeds and umbrellas. La Meduse dinner restaurant in Mykonos:This is undeniably one of the best gourmet restaurants on the island of Mykonos. Indulge in the exquisite culinary experience it generously offers, in an ambiance of impeccable aesthetics, with fine marbles, stunning artworks, candles, soft music, and idyllic view of the moonlit beach of Ornos. Enjoy the fresh fish as well as international and Mediterranean cuisine.AM BREAKFAST:Hearty, delicious, energy-boosting breakfasts.An incredible breakfast buffet awaits the guests of Kivotos Luxury Boutique Hotel in the restaurant La Meduse, served daily from 8 am until 11 am. The delicious hearty buffet includes delicacies from the international and local cuisine, as well as energy-boosting, yet healthier choices. La MedLe Poolside Restaurant:The à la carte restaurant Le Pirate is a seaside paradise of Mediterranean flavors. It is nestled in a heavenly shaded patio, right by the pool, overlooking the azure waters of Ornos bay. The relaxed atmosphere and island chic surroundings urge you to enjoy the fresh salads, delicious pasta, local specialties, as well as various Mediterranean delicacies. Every Saturday there is a hearty barbeque buffet, with an incredible variety of grilled meat for everyone to enjoy. 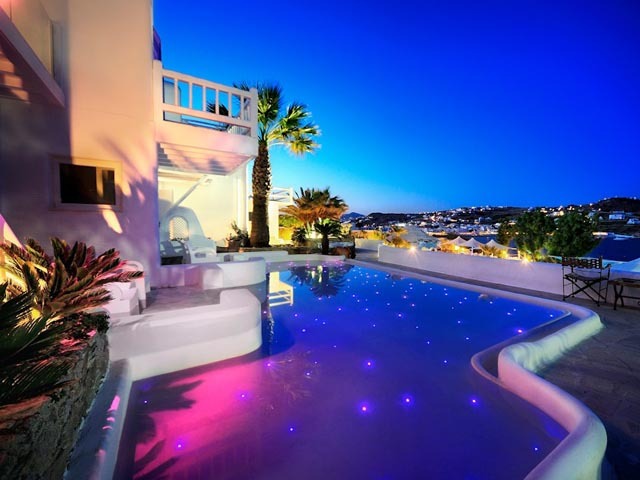 Del mar Bar:Mykonos is the ultimate sun and fun destination and Kivotos Luxury Boutique Hotel has the hippest swim-up bar on the island. Famous for its incredible, inventive cocktails, super cool ambiance, and exceptional selection of music, Del Mar seductively urges guests to enjoy the sizzling Mykonian sun and heavenly cool breeze with a delicious cocktail, beverage, or coffee in or around the pool. Open all day from 10 am until 7 pm. 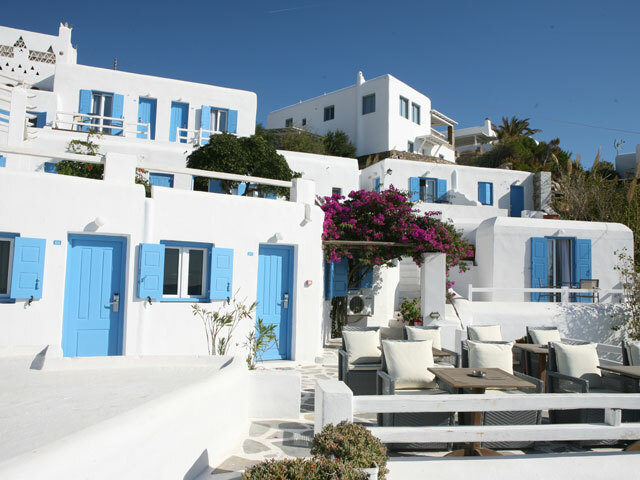 K Bar: is the cosmopolitan, boutique and ultra-chic bar of Kivotos Luxury Boutique Hotel in Mykonos. The cool, laid-back atmosphere, soft music, wide selection of fine wine labels, champagne, cocktails and alcoholic beverages, as well as the exclusive cigar collection create the perfect setting for quality moments of socializing with friends and loved ones.